From the very start to end, music and melody was predominant. 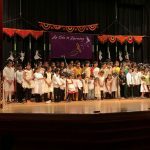 At the outset nearly 50 students of Gopa Kuteeram beautifully presented two delightful songs “Humko Man Ki Shakti” and “What a Wonderful World” that warmed up one’s heart. 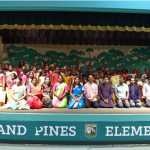 Gopa Kuteeram is a worldwide children’s enrichment program hosted by Global Organization for Divinity, active in four centers across Houston – Pearland, Cypress, Sugarland and Clearlake. Music connects people naturally; even newborns connect with music. When we hear a good beat, it makes us want to move. You might find yourself tapping your finger or foot in time to a song or nodding your head at a concert. 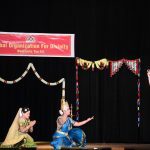 The second presentation saw soulful renditions extolling the divine names carefully picked from Madhura Geetham, a collection of divine compositions of His Holiness Maharanyam Sri Sri Muralidhara Swamiji. 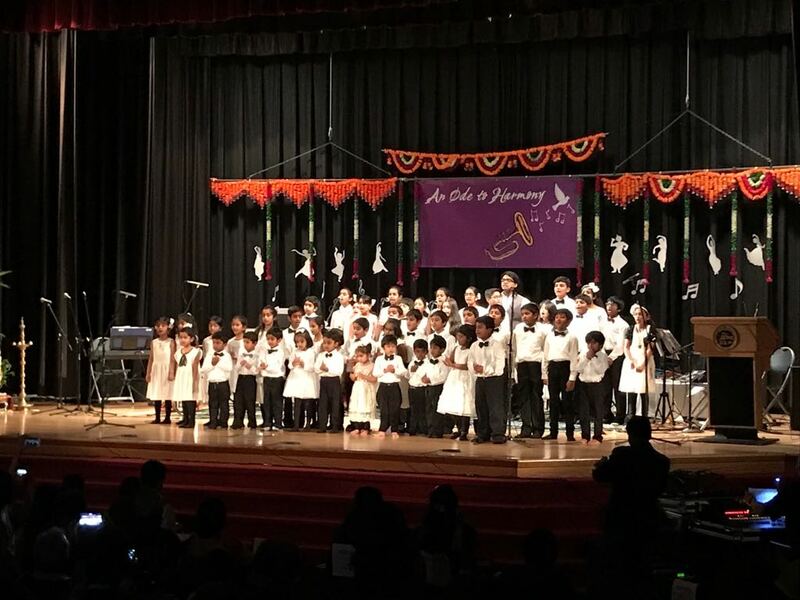 Melodically divine voice of Maha Krishnan and Sandeep Kumrouth’s orchestra “ShreeKrithi” team captivated the audience with renditions of popular Meera Bhajans. 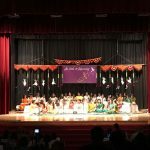 Krishna Gana Sudha Music Academy directed by Vidushi Smt. 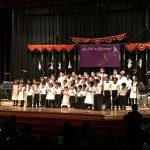 Rajarajeshwary Bhat included an ensemble of 30 children singing in joy and thrilling the audience with their mellifluous diction. 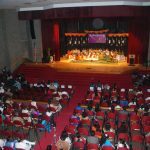 The unison of singing the notes was led remarkably by Kruthi Bhat. 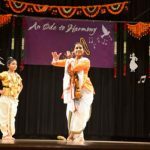 Dhruva Musical, a theatrical presentation and a brainchild of Sri Ramanujamji with poems written by Sri Poornimaji aesthetically portrayed a life changing incident from the life of prince Dhruva. Picked from Srimad Bhagavatam, the presentation showed how Dhruva’s stern determination to see God, won the heart of his Guru and finally led way to seeing the Lord Himself. This musical will soon be a full-fledged production of G.O.D. The last segment comprised of an incredible musical medley beginning with Fort Bend Brass Quintet followed by the Pasadena Memorial High School First Edition Choir. 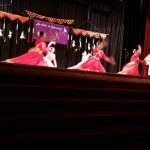 This was followed by a charming Chinese folk dance presented by 3 young girls from J&H Dance School tiptoeing on their feet. 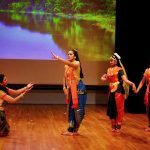 The penultimate number was an unusual combination of Kathak and Bharatanatyam dance by Sreepadam School of Arts and Shivangani Academy defined as ‘Mile Sur’ Bharatanatyam and Kathak performance. The program also including the annual giving program commemorating Namadwaar’s anniversary. 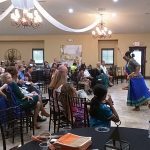 This year the beneficiary was “The Well on Masters Road”, a food pantry and nonprofit service organization located in Manvel, Texas. 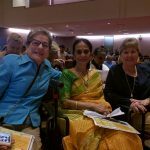 Special guests were Honorable Mayor Debrah Davison of Manvel, Ms. Ruth Dietz from The Well, Sri Ramanujam ji and Sri Poornimaji, disciples of HH Maharanyam Sri Sri Muralidhara Swamiji. 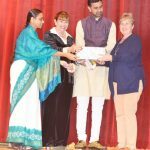 The giving program segment was led by Smt. 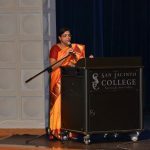 Thara Narasimhan, secretary of Hindus of Greater Houston, active community volunteer, and friend and supporter of Global Organization for Divinity who introduced the guests and conducted the program. 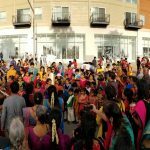 They noted the enormous effort that was put in to have close to 200 participants of different age groups, present multi-ethnic, thematic presentations of music, dance and theatre. Sri M.K. 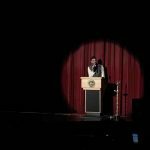 Ramanujam, a world renowned inspirational speaker and keynote speaker of the event, reinforced the universality of music that unifies humanity with a message of peace and harmony. 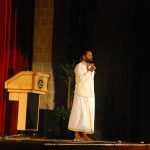 He said that music helps us connect with the divine spirit within all of us, bringing about inner peace, also emphasizing that a harmonious world can be achieved by transforming individuals and how community charity organizations like GOD and LTSFA work with one person at a time hoping to make a difference in the world. 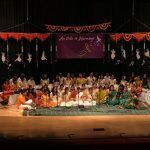 Singing together for Universal Peace with Mahamantra chanting as the only path to easy salvation shown by His Holiness Sri Sri Muralidhara Swamiji, was performed by the whole ensemble led by Sri Poornima ji. 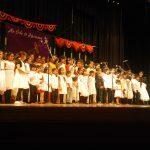 Almost 60 children from tiny tots to adults sang in unison the grand finale of chanting of Mahamantra in many languages. It was a marvelous conclusion that made it a supremely divine Ode to a harmonious evening. Artists from the Pearland Arts League and individual artists from around Houston had displayed their themed artwork at the event. 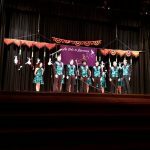 Special thanks to these artists as well as the sponsors Deep Foods, Gastroenterology Consultants, Kumon, Benefit Concepts Inc., RVS Insurance Group LLC and Royal Pharmacy.